Interest in the Universal Basic Income (UBI) is sweeping across Europe, with British think tank RSA coming out in support of the UBI in a new report launched on December 17 at a public debate. 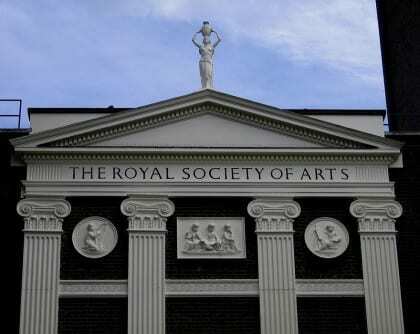 The Royal Society for the encouragement of Arts Manufactures and Commerce, also known as RSA, is a prestigious institution founded in 1754 and granted Royal Charter in 1847. Report authors Anthony Painter and Chris Thoung said the current approach to welfare “is no longer fit-for-purpose” and requires a new approach. “The major concern is ultimately people: the lives we are able to lead, our ability to have a sense of security so we can pursue our ambition, and our ability to contribute to supporting one another, innovating, and developing the creative potential of society,” the report said. The RSA endorsement follows another high-profile British think tank, the libertarian Adam Smith Institute. They published a report earlier this year also advocating for a basic income in the form of a negative income tax. The RSA report suggests replacing the current welfare state with a UBI that would cost an additional 1 percent of UK’s GDP. RSA’s proposal is modeled after the Citizen’s Income Trust (CIT), an affiliate of BIEN, and derives most of its figures from this framework – read the CIT proposal here. Under the RSA, citizens between 25 and 65 would receive an annual income of 3,692 British pounds, or £308 per month. People between 5 and 24 would get an annual payment of £2,925, or £244 per month. Citizens over 65 would receive an annual pension of £7,420, or £618 per month. Parents of children under 4 would receive an additional annual payment of £4,290 for their first child, or £358 per month. They would fetch £3,387 annually, or £282 per month, for additional children under 4. It suggests potentially gradually rolling out the basic income to different demographics, such as those above age 55 and those below age 25. At the same time, a small basic income could be introduced while gradually reducing other benefits. Regarding housing, the report notes that housing benefits should not be folded into a basic income because of the high cost of real estate in the UK. It proposes a Basic Rental Income. The idea is to utilize property taxes as a means to ensure universal housing income, but the report does not delve into the specifics. Nonetheless, this novel approach does deserve more discussion in UBI circles. In offering these policy specifics, the RSA illustrates that a UBI is not simply a utopian ideal, as some of its critics claim. In fact, the report points out that far more radical changes to taxes and benefits have been implemented in the past. Painter and Thoung note that a UBI would help society confront challenges created by rapidly improving technology and an aging population, a point that most other UBI proponents stress as well. Since the UBI is universal there would be less fraud, they contend. And it would not undermine relationships and families because a UBI would not punish individuals for cohabitating as the current system does. This “strengthening of the family” aspect will likely win over more conservatives to the UBI cause over time. From an economics perspective, the report argues that a UBI is the best system to incentivize work and avoid the welfare trap. In the current system, benefits quickly diminish as incomes rise, discouraging beneficiaries from taking up work. The report also claims that a UBI’s safety net allows individuals to pursue risks and creative endeavors. Instead of taking the first menial job available, a worker can spend more time searching for the work most suited to increasing their productivity. This argument has been borne out by empirical studies on the UBI, such as the basic income trial in India that substantially increased entrepreneurship. One of the criticisms of a UBI is that it lets some individuals take more time off from work. The key is whether their free-time activities are more valuable to society than their work hours. “Basic Income is a foundation for contribution. It incentivizes work but supports other forms of contribution too,” the report said. It suggests that the UBI would allow individuals to care for the elderly and other vulnerable individuals, which is especially important as society ages. The actual work disincentive effect has been found to be small. The report briefly reviews evidence from experiments with a negative income tax carried out in the US and Canada between 1968 and 1980. The loss of labor hours for men was minimal. Women did lower their workload more substantially. They chose to spend more time with their family or newborns, activities of high social value. In Alaska under the Permanent Fund Dividend, a policy similar to a UBI, inequality fell in the 1990s and 2000s, while it increased in every other American state. Another key issue is who qualifies for basic income and whether it would be extended to migrants. RSA’s proposal states that EU nationals should have first “contributed to the system for a number of years” before receiving the basic income. International migrants would be subject to current rules to access benefits. Individuals serving custodial sentences would have benefits restored once their sentence was concluded. In recent years, the welfare system has lost public support as people demand more rules and conditions for the poor to receive assistance. However, benefit sanctions are becoming increasingly “inhumane,” the authors said. In order to detect tax credit abuse, the system has become overly intrusive into citizens’ lives and activities. The RSA makes a few recommendations for how the UBI will be applied to the youth, including requiring young adults between 18 and 25 year old to declare how they would use the income. They would sign contracts “with their local community” and not the government, and there should be “no state monitoring” of the contracts, the authors noted. Additionally, those over 18 would have to register to vote in order to receive the UBI. In suggesting tying the basic income to the community, rather than the government, the RSA report shows precisely the unique potential of the UBI to move away from the impersonal welfare state and toward a more relationship-oriented society. These arguments parallel that of free-market economist Charles Murray in defense of his own UBI scheme. This report is a serious and comprehensive look at how a UBI could realistically be implemented in the UK. 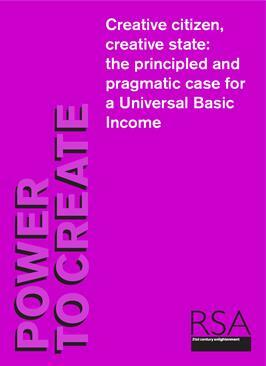 It provides a persuasive look into the economic, societal and moral underpinnings of the basic income. As the debate over the UBI continues to simmer across Europe, the UK will be hard-pressed to ignore this pragmatic approach for a radical overhaul of its welfare system. Anthony Painter & Chris Thoung, “Creative citizen, creative state: the principled and pragmatic case for a Universal Basic Income,” RSA, December 16, 2015. Anthony Painter, “In support of a universal basic income – introducing the RSA basic income model,” RSA, December 16, 2015. Citizen’s Income Trust, “Citizen’s Income: a brief introduction,” 2013. Andrew Walker, “Think tank floats ‘basic income’ idea for all citizens,” BBC News, December 16, 2015. Tyler Prochazka, “Would a universal basic income be the ‘death’ of civil society?” Basic Income News, November 21, 2015. Maz Ali, “Money. For free. It’s been tested in Canada and India. Now one Dutch city wants to give it a whirl,” Upworthy, September 4, 2015. The American economist Henry Hazlitt explains in chapter 11 of his book ‘Man vs Welfare State’ why a basic income scheme can only lead to poverty for all. Better is to significantly lower taxes and abolish minimum wage laws. There have been intelligent people, at all stages of human evolution, who have arguably disproved all great ideas that led to leap developments in human society: the abolishment of slavery (here it even came with a supposely “cientific” argument that whites are superior to blacks), the introduction of vote for women, the establishment of the Welfare State, the protection of natural environment, and so on. Dispite their arguments, these attempts are usually ideology-driven, in an urge to maintain status-quo. In any case, pure market-law driven society (“significantly lower taxes and abolish minimum wage laws”) has already proved itself to be unfair, unequal and an enemy to core values like cooperation, empathy and solidarity. Did his eminence in economics answer why his theory seems only to be negatively applicable to women but he appears totally ignorant of the trillions paid out in corporate welfare over the decades globally…..Wonder why that is —and if corporations would still be at the taxpayer teat, every year if they too agree that it leads to poverty for all –with the only exception being corporations……Explain please…..? We (basic income activists) try to view things on the bright side. That’s not to say that we cannot see the dark side, it just means we are focused on the positive aspects, and that these will eventually – with us working on it constantly – overcome the negative ones. Of course there are huge amounts of corruption out there! But should this prevent us from devising and implementing a better system for all? One of basic income’s potential outcomes is that people, more empowered and less frightened by scarcity and poverty risks, will denounce more and more corruption schemes, and remove their implicit support for these actions, in companies, in government, in institutions. And that will eventually reduce corruption and hence the eventual sacking of the many by the few. Any time someone (especially an economist) predicts a significant shift in policy, towards something as completely new/untested on a large scale as a BI, “can only lead to” anything, I find myself disinclined to click the link. I seem to recall, just a few years ago, many eminent economists predicting QE would send us into a feedback loop of disastrous inflation. It wouldn’t surprise me at all to learn many of them were posting their assurances on mises.org. Odd, isn’t it, after fleecing each and every taxpayer and government global to pay off their derivative gambling debts that went 90% as the cause for the 2008 financial disaster, the powers that be —our criminal 1% are ‘allowing’ this discussion on basic income…..entitlements…..Bull—-I want every cent paid back that they took in bailout monies and every dollar in corporate welfare subsidies paid by each country accounted for and put on current paid up status –instead of deferred forever status…’….Oh, if anyone thinks these subsidies are mini-sized, Canada, paid out 695 billion since the 70’s for nothing in return —its all about our governments corruption…..! £308 per month would not cover the rent for a small flat/bedsit, let alone other costs. So everyone would still need a job, people would still be homeless, etc; we’d be where we are presently. I like some of their ideas but the figures seem wrong to me. I like the way that it will encourage people to form community and pool resources and won’t be penalised for so doing. And I like how it will discourage social security fraud. It will be far simpler to administrate..
It’s great to read that a prestigious think tank has supported the idea – I suppose they must have given it a lot of thought. For me the missing part is that money $£¥is an artificial construct anyway. It would be better if the income was given in electrical energy – kiloWatthours – something that is inherently valuable – this could be collected from the environment through renewable energy infrastructure. and then transmitted to the people’s homes through the power lines. Instead of taxpayer money directly funding the BI, that money could fund the renewable energy infrastructure build, and then that value could be leveraged to ongoingly collect clean green energy, that is then equitably given to everyone. Commenters against this idea, as in so many other fields requiring change to the ways we live, strike me as nay-sayers, panic stricken by “‘the new”, always looking over their shoulder, living and thinking from the past., Perhaps it’s a “coincidental” feature of such an outlook, that produces both defence of the status quo, conjoined with shaky logic, narrow self-interest and spurious appeals for “SafetyFirst!” to preserve their “philosophy of life”,the entire personality representing a form of “project fear”,To me (now in my late 70s) I have been meeting this spiritual disorder my entire life, and it has been largely responsible for the mess in GB and much of the rest of the world ..